The Deeside Inn is situated in the centre of Ballater which is a beautiful village in the heart of Royal Deeside. 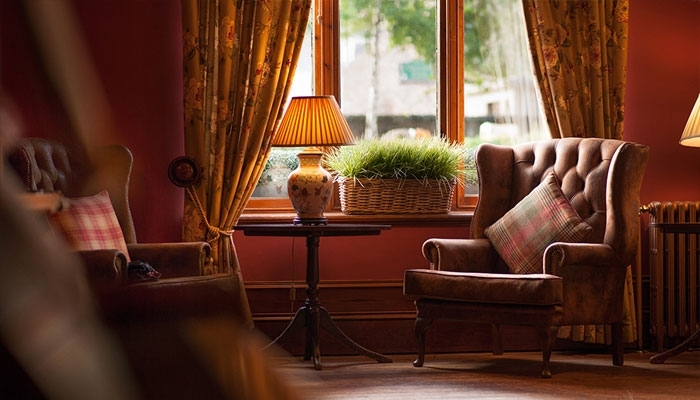 The panelled entrance and log fires instantly demonstrate its friendly, "home from home" atmosphere which can be enjoyed in the cosy lounge bar, traditional restaurant and quiet lounge. Guests can take time to explore Royal Deeside including Balmoral Castle, Crathie Kirk or enjoy outdoor activities including golf, walking, fishing and cycling. The Deeside Inn sits in the centre of the picturesque Royal Deesdie village of Ballater, at the heart of the Grampian Highlands. Throughout The Deeside Inn period features are evident including wooden panelling, wooden beamed ceilings and Queen Victoria's famous wooden toilet has been retained. All of our rooms offer full en-suite facilities so if you have been leading an active lifestyle during the day, relax in a hot bath or shower before dinner. There are tea and coffee making facilities in all rooms with Scottish short bread available as an accompaniment. Our well appointed rooms comprise 18" flat screen televisions, ensuring that you have the chance to catch to on the news or your favourite shows while on your break. Our restaurant is located on the ground floor. It has been stripped back to natural wood and this is complemented by the burgundy shade on the walls. The tables are finished off with local slate place mats and crisp white linen napkins. In the cooler months we light the roaring log fire to provide that extra glow. Food is served throughout the day, offering a large selection of fish, grill and game alternatives with some classics thrown in for good measure. The colours used in our lounge are warm, cosy and welcoming with the added bonus of a real fire to provide extra warmth when required. Sink into one of the large settees to catch up on the papers or relax throughout the day in comfortable surroundings. One of the most popular parts of The Deeside Inn is the superb ceilidh bar. It offers a variety of beers and wines and a wide range of malt whiskies - with the Malt Whisky Trail nearby, there's a great selection to choose from. We offer an extensive wine list from easy drinking sauvignons to full bodied merlots. Alternatively, favourite spirits are on the shelf as a cool aperitif as are liqueurs, enjoyable after a good meal. The Cairngorms and Grampian Highlands dominate the skyline of the area and are home to a wide variety of wildlife and activities, many of which can be enjoyed on your break on Royal Deeside. Local attractions include Balmoral Castle, Cairngorm National Park, Royal Lochnager Distillery and the Old Railway Station in Ballater. Fishing in the River Dee, one of Scotland's greatest rivers and renowned for its salmon is perfect for those lazy summer days. Royal Deeside and the Cairngorms is a veritable walker's paradise with mountains such as the Cairngorm, Lochnagar and Lairig Ghru all in the area. A selection of Munros in the area offer serious walkers/climbers a good challenge, with many other trails and footpaths giving the opportunity for a more relaxed walk and chance to explore. Cycling and mountain biking are also favourite activities in the area. Quiet roads and country lanes are ideal for a family day out, with the Deeside Way cycle path offering an alternative. Serious mountain bikers are able to test themselves out on more arduous grounds with mountain trails and forest paths providing a real challenge. Royal Deeside is home to 10 excellent golf courses which are dotted throughout the area. Ballater Golf Club itself is a testing 18 hole course set in spectacular countryside and offers golfers of all abilities a real challenge.